Abstract. Atmospheric nitrate deposition resulting from anthropogenic activities negatively affects human and environmental health. Identifying deposited nitrate that is produced locally vs. that originating from long-distance transport would help inform efforts to mitigate such impacts. However, distinguishing the relative transport distances of atmospheric nitrate in urban areas remains a major challenge since it may be produced locally and/or be transported from upwind regions. To address this uncertainty we assessed spatiotemporal variation in monthly weighted-average Δ17O and δ15N values of wet and dry nitrate deposition during one year at urban and rural sites along the western coast of the northern Japanese island of Hokkaido, downwind of the East Asian continent. Δ17O values of nitrate in wet deposition at the urban site mirrored those of wet and dry deposition at the rural site, ranging between ∼ +23 and +31‰ with higher values during winter and lower values in summer, which suggests the greater relative importance of oxidation of NO2 by O3 during winter and OH during summer. In contrast, Δ17O values of nitrate in dry deposition at the urban site were lower (+19–+25‰) and displayed less distinct seasonal variation. Furthermore, the difference between δ15N values of nitrate in wet and dry nitrate deposition was, on average, 3‰ greater at the urban than rural site, and Δ17O and δ15N values were correlated for both forms of deposition at both sites with the exception of dry deposition at the urban site. 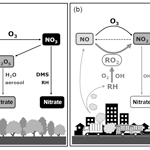 These results suggest that, relative to nitrate in wet and dry deposition in rural environments and wet deposition in urban environments, nitrate in dry deposition in urban environments forms from relatively greater oxidation of NO by peroxy radicals and/or oxidation of NO2 by OH. Given greater concentrations of peroxy radicals and OH in cities, these results imply that dry nitrate deposition results from local NOx emissions more so than wet deposition, which is transported longer distances. These results illustrate the value of stable isotope data for distinguishing the transport distances and reaction pathways of atmospheric nitrate pollution. How to cite: Nelson, D. M., Tsunogai, U., Ding, D., Ohyama, T., Komatsu, D. D., Nakagawa, F., Noguchi, I., and Yamaguchi, T.: Triple oxygen isotopes indicate urbanization affects sources of nitrate in wet and dry atmospheric deposition, Atmos. Chem. Phys., 18, 6381-6392, https://doi.org/10.5194/acp-18-6381-2018, 2018. Atmospheric nitrate may be produced locally and/or come from upwind regions. To address this issue we measured oxygen and nitrogen isotopes of wet and dry nitrate deposition at nearby urban and rural sites. Our results suggest that, relative to nitrate in wet deposition in urban environments and wet and dry deposition in rural environments, nitrate in dry deposition in urban environments results from local NOx emissions more so than wet deposition, which is transported longer distances.